Chef Max Hansen has announced plans for a 25,000-square-foot new catering venue in an old farmhouse on Carter Road in Hopewell. The $7 million project geared to weddings, corporate events, and catered affairs is scheduled to open by the summer of 2017. The project will create some 100 full-time jobs. The location will also become the headquarters for Mr. Hansen’s entire operation. For the past 25 years, Max & Me Catering, Max Hansen Caterer, and Max Hansen Carversville Grocery in Bucks County have served the area. The 9.5 acre venue located at 328 Carter Road in Hopewell, which can accommodate more than 300 guests inside as well as on an elevated deck overlooking a pond, and on a manicured lawn adjacent to the pond, is being designed by Studio Hillier which is run by husband-and-wife architects Barbara and [Town Topics shareholder] Robert Hillier. The farmhouse sits on a larger, 300-acre property, and is an anchor to an 82-acre business campus. It is located a seven minute drive from downtown Princeton. The design calls for the removal of the existing farmhouse’s roof and construction of a modern barn structure, giving the original farmhouse, which was built in 1830, the look and feel of a renovated New England farm compound. The 1,700-square-foot deck and lawn will allow guests the opportunity to enjoy the al fresco spaces when weather permits. Weathered exterior walls will be juxtaposed by plaster and massive windows beside a fieldstone walkway. 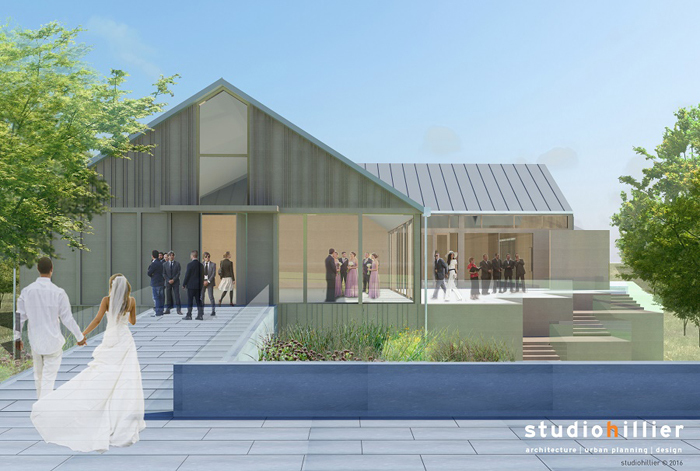 Studio Hillier plans on using reclaimed and repurposed wood for the building design, and hand-stacking stones for a fireplace that will be visible from the interior and exterior. A native of Bucks County, Mr. Hansen has cooked for First Lady Michelle Obama, former Presidents George W. Bush, George Herbert Walker Bush and Bill Clinton, as well as the 2000 GOP Convention in Philadelphia. Most recently, his team were catered the National Football League’s cocktail party at the Meadowlands for Super Bowl XLVlll in 2014, and for the New Jersey Manufacturers’ 100th Anniversary Celebration. Mr. Hansen will be relocating his entire culinary base of operations from Doylestown to the Princeton farmhouse, creating a state-of-the-art, 7,000 square foot commissary with a centralized kitchen for his business. The project will offer a number of openings for kitchen and wait staff, along with several part-time positions. While the farmhouse will primarily be used for private affairs, Hansen and his team also plan to utilize the venue to host meetings, conferences, seminars and other corporate events, and in support of the community of non-profit organizations in the area. Mr. Hansen also plans to provide culinary services for the two business complexes on the property, which employ roughly 800 full-time workers. Mr. Hansen will be introducing a world-class chef to run the culinary operation, and notes that the new venue will contain high-tech audio and video capabilities geared to bridal and corporate guests. He eventually hopes to offer cooking classes at the facility. Mr. Hansen will also be utilizing many of the ingredients grown within a five-mile radius of the location, including fruits, vegetables, cheeses and other fresh foods from neighboring Cherry Grove Farms, Terhune Orchards and Blue Moon Acres.